One of my favorite newspaper reads is humorist Sam Venable’s column in the Knoxville News Sentinel. Usually he devotes the entire column to one topic, but often he does short coverage of several topics. I find I often prefer the multi-topic columns best and so that’s what I’m doing today – truly some eclectic ramblings. I notice I have two new followers and comments from some other new readers and I just want to tell all of you how flattered I am that all of you take the time to read my ramblings. 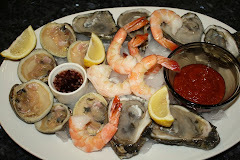 Seems as most blogs are about something in particular, eg – BBQ, farm life, gourmet food, etc., but I want mine to just be “what’s going on around here today.” It is heavily slanted toward food as that’s something we do everyday and we try to do it well. So thanks for stopping by and thanks for the comments. There’s not much happening around here today. Alex is home from school for the third day with a stomach ailment. We don’t know if it’s a mild case of the flu or just a stomach bug, but since she prefers to be in the living room, where my computer and I are located, I’m getting caught up on the “SpongeBob” cartoons I’ve been missing out on and trying to avoid catching her ailment. I posted this info as a comment in another blog and know some of you have done an item on spatchcocking – butterflying - a chicken on your blogs, but thought I’d post here in case some of you missed the others. This is a link to a good video for the process- .link According to a recent discussion by chef Wolfgang Puck, this preparation method is the key to moist evenly cooked chicken - http://abcnews.go.com/GMA/recipe?id=8603573 . I cleaned up and re-oiled the cast iron dutch oven from yesterdays cook and can’t tell you how hard it is not to fill it full of hot soapy water to scrub all of the grease off. My mom always used cast iron skillets and washed with soap, but they may have been in the family for generations and there was no way to scrub down to the metal without sandblasting. One of the things I’ve figured out after blogging for 2 months is that a lot of photography is usually involved and, while I was into it in my 30’s, it’s been awhile since I tried to take good pictures. I’m even contemplating finding the book for my Kodak Easy Share and seeing what all it will do besides point and click pictures. I know it will do videos because the 11 year old did it. Not only do I not know how, I didn’t even know it would do that. Anyway, today for the first time ever, while mowing the grass, I rode around with my camera around my next taking pictures – and I enjoyed it – and I got a couple of nice shots. Here are a few of them. I was walking down to get out the mower and saw the butterflys flitting around the butterfly bush. The snowball bush seems to have forgotten what season it is. Who says veggies are just for eating. Here are a couple shots of a black pearl pepper (ornamental but still a pepper) and it would be hard to find a prettier plant. I do a little presentation for garden clubs on using veggies to get an early spring start in the flower garden. Later in the fall I'll try and remember to post some of the pics. The okra and maters have done there job and are fininshed for this year while the other things are also done or ramping down quickly. Lot's of new growth on the blueberries holds the promise of another bountiful crop next year. We like to have a live tree at Christmas but won't do it for just the two of us. But since we have an 11 year old in the house, it will be a live tree year. My daughter planted several 7-8 years ago for cutting and here is the one for this year. After a little shapping it will make a beautiful tree. I bought some new cast iron cookware in the spring, with the idea of expanding my cooking repertoire, but couldn’t get motivated to launch into it during the hot summer months. Now that fall has arrived and the weatherman is predicting a 68* day, I believe it’s time. We had a nice big chuck roast in the freezer that needed to be eaten and since well marbled chuck is pretty forgiving, it seemed like the logical first choice. While I’ve cooked with cast iron all my life, I’ve never actually used it as an oven. After trimming the roast, I added a light coating of Worcestershire, then some steak rub and salt and a dusting of flour, then off to browning. I had the oven heating but didn’t have enough coal going to get the temp I wanted. I then didn’t start the next batch soon enough, but I finally got the meat browned, added a layer of sliced onions to the bottom for the meat to sit on and then some McCormick au jus mixed per pkg instructions- about 11:30am. Here’s my set up. I used the grill, as I didn’t have a table, with hitting the grill rack wires with the cooker legs being the only issue. I’ll get a piece of sheet metal for the next time. I started off with 6 bottom and 13 top coals, but it was cooking pretty hard and I was afraid the meat would be done too soon (dinner at 6pm), so I went to low and slow mode with 5 on bottom and 10 on top. It took me a couple of times to figure out how to best get the charcoal ready the fastest. I haven’t used Kingsford briquettes in years and as a barbecuer, I’m used to cooking with wood in my offset or good lump in my Stumps. 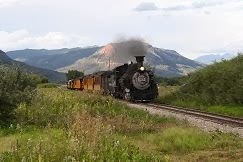 But, sitting out there while the charcoal was lighting brought back memories of my childhood days when the winter air hung heavy with the aroma from coal burning furnaces. – can’t say I miss it. I went to flip the meat at 2:30 and checked the internal temp. It was at 206 and the probe went in like butter – obviously done and not cooked as slow as I thought. So I added the first veggies (carrots, onions, beans) to the pot and tented the meat with foil and covered with 3 towels. I needed more coals ready at this point to overcome all of the cold veggies I added. I need to learn to think 20 minutes ahead for this process. Added the potatoes and celery at 4:00pm and some corn starch at 4:30pm and the meat back in at 4:45pm. Here's a shot of the plated veggies - think I needed a little bigger platter. Here's my plate - considered biscuits but decided on a slice of homemade bread instead. All in all it turned out real good. Next time I’ll break the meat into big chunks, de-fat it and put back in the pot as it could have been more tender. I’ll also use some herbs, which I meant to do but forgot. For the first try, I’m pretty pleased. One thing I’ve learned today is like BBQ, D.O cooking is all about fire management and practice is required. My home town of Fairmont, WV can lay claim to be the inventor of the pepperoni roll and they are in fact delicious, especially when spit open and dressed with pizza or hot dog sauce, peppers and cheese. Growing up there, I also operated under the misconception that, in addition to the rolls, they provided the one true hot dog – or at least the true West Virginia hot dog – maybe because there has to be more mom and pop hot dog shops per capita than anywhere else on the planet. In that area it’s all about the sauce (called chili in other parts of the world) and the recipe is guarded as though it were the crown jewels. The classic dog when ordered with everything will be a boiled wiener on a steamed bun and have sauce (which is usually somewhat thin), mustard and onion with a very few places serving slaw on request. Come to find out, there are just a few counties in Northern WV that serve them this way and the true WV hot dog has slaw as standard - I was shocked when I learned this just a few years ago. Having said all this, you can imagine my reaction when I moved to Tennessee, ordered my first hotdog with everything and received a dog with mustard, onion, canned Hormel chili, and slaw – I guess it could have been worse had a little ketchup been added. I’ve since learned, thanks to Food TV, that German immigrant Charles Feltman on Coney Island is regarded as the hot dog inventor, not someone in Fairmont, and a Chicago Dog doesn’t even have sauce – shocked again. Since hotdogs are one of my favorite foods (like Ben Matlock), I took my East Tennessee born wife to Fairmont early in our marriage and introduced to her pepperoni rolls and a good hotdog, after which she used several recipes and to create an excellent hot dog sauce (recipe secret of course). She makes it in big batches and freezes in pint containers. I like it on burgers, pepperoni rolls (which she also makes), and off course dogs – sometimes just sauce, mustard and onion – no wiener. I still eat mine like I was learnt to do but she likes to jazz hers up with other stuff. Here’s a couple pics of Monday night's dinner. Would have sided it with something, but what could possibly be better than another hotdog. The grilled wienners with a little carmelization as they say on TV. Beverly's first one topped with cheddar. Beverly's second topped with slaw and cheddar. I cooked an extra for the pets, but the first two went down so easy, I had a third one for dessert. It's hard to beat a good dog. 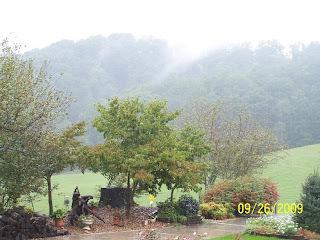 We ended up getting 7 inches of rain this past week, which pales in comparison to what they got south of us, but none the less a significant rain event. Here’s the same view, as posted Saturday, on the day after the rain. We live on a TVA lake and it is used for flood control, so it often holds extra water after heavy rains. Here are a couple of pics from our dock. At normal summer pool level the ramp from the fixed platform to the floating dock is level to slightly downhill. 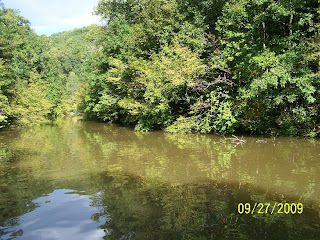 During the winter it goes down about 6 feet to the dock, but today it is running uphill about 2 feet. Floating docks don’t work well in high boat traffic areas with lots of wakes but we’re in a small dead end cove with only the occasional fisherman. I know - that's an ugly color for a shed - it was supposed to be a green shade. Even more revealing are pics of the fixed docks. 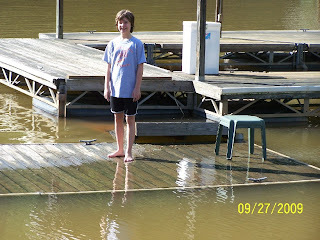 The first one shows Alex standing on the fixed ramp to a floating dock with the top at water level. 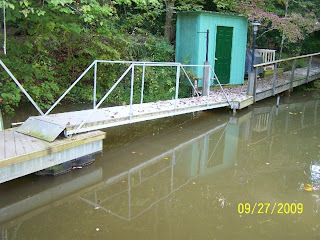 This is a fixed dock where the water is within 6-8 inches of the deck level. 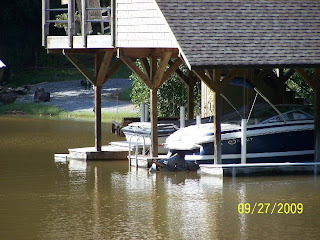 We had a similar situation several years ago and while touring around on the boat, found several folks sitting on their docks which were an inch underwater and totally unseen from our angle. They appeared to just be sitting in their lawn chair on top of the water. Unfortunately I did not have the camera along. The silver lining - I believe we're out of the lawn and garden watering business for a while and the water shortage in North Georgia should be about, if not totally, erased. 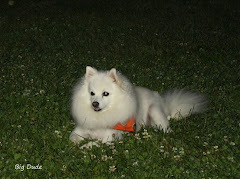 If I were a dog, I’d be referred to as a mongrel, such is the lack of purity in my bloodline. I’m a mixture of Irish, English, Dutch, American Indian and who knows what else. As a result, I’m confident there must be some German in there somewhere which might help explain my love of pork, potatoes, bread and good bier. Being as this is the case, I think there is a sufficient enough reason to celebrate Oktoberfest with a German meal. So for dinner tonight it was jagerschnitzel, German potato salad and caraway kraut using recipes from Allrecipes http://allrecipes.com/Recipes/Holidays-and-Events/Events-and-Gatherings/Oktoberfest/Top.aspx. The last time whole boneless pork loins were on sale, I bought one and cut some thick chops for grilling and some thin ones for cutlets which were used today. I pounded them out to ¼ in thickness, breaded and fried. Made up the potato salad per the recipe using potatoes, onion and parsley from the garden – added a few slices of crumbled bacon to it. The kraut was store bought with some caraway seeds already added. I’ve made kraut over the years and have yet to make any I like as well as what come in bags from the store cooler (except this). We even bought some from Ohio Amish country during a visit a few years ago and I still like the store bought better. I would have washed it down with some German beer but since I didn’t decide until today to cook this and thanks to local Blue Laws, the lack of stores in the greater metropolitan middle of nowhere I live in, and my unwillingness to use the gas to drive 20 miles, I did the best I could. I could have drank Budweiser since it was founded by two Germans, but I settled on Sierra Nevada Pale Ale as it at least taste a little European. We topped it all off with some semi homemade black forest cake. I really hoped to report on a great meal, but frankly the beer was good, the cake was pretty good, and I’ll never make any of the other recipes again. Oh well, such is life on the food journey. I know this will only appeal to a few family members, but decided to post it for them. We finally got around to refurnishing the guest room to make it the granddaughters room. She made it very clear she did not like the “motel furniture” that was in there. Motel furniture = rich pecan finished wood, signed prints and candle sconces on the wall, antique stained glass lamp and no hot pink throw rugs – wish I’d taken a before pic. So she and Bev went shopping at Wallyworld and then shopped some more on line and she picked out what she believed was needed for a normal 11 year olds room. I spent about 7 hours over three days doing the “some assembly required” part – I think I may hate those three words more than any others. After getting the furniture in, Alex spent several hours getting it organized to suit her (corkboard wall hanging, lava lamp, etc) and here are the results. She decided against a dresser as she keeps her clothes on hangers or in baskets in the closet. We still need a stand for her monitor, radio, etc. According to this mornings weather report, we're in for a significant rain event and looking on the http://www.wunderground.com/ map, I am a definate believer. We've had 3" so far this week and may yet get that much more. 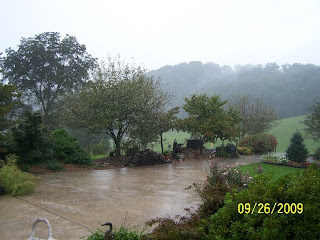 As a gardener, I try never to complain about the rain because while getting a lot of it can be a major issue, not getting enough to grow food can be far worse and I hope I never see it. And speaking of food, I finally finished off my cheese grits by dredging in flour and frying. Between no coating, cornmeal, and flour, I believe I like the crust provided by the flour the best. I decided to eat it as a meat lovers special so I warmed up a couple slices of bacon and a slice each of regular breakfast and Czech sausage fatty. May have to do double Lipitor today - but it sure was good. The fridge has gotten so full of leftovers and other stuff that we realize we must quit cooking new dishes until we eat up or toss what we have. So for breakfast today, it was some smoked breakfast fatty, Cabot sharp cheddar and eggs on an English muffin and homemade mater juice. Not quite gourmet, but I sure like it. Have I mentioned, I like breakfast food. For those of you who make your own juice, our recipe is simple. I grow paste tomatoes (Kada Hybrid & Quimbaya) for canning and juicing, tossing in any extra slicing tomatoes. The paste tomatoes give a naturally thicker juice without further cooking. We just core the tomatoes, cut out bad spots, and cook until softened. I then run them through a tool that’s been around my family for 4 generations. My dad called it a ricer, but it may be a chinois. Here’s our set up. There are likely better ways to do this, but there’s something about keeping up the tradition, not to mention the great juice, that keeps me doing it this way. There’s just no comparison between what we make and the commercial juice. After juicing, we put into jars with one teaspoon of canning salt (complicated recipe isn’t it) and process – we use a pressure canner (12 lbs for 10 minutes) because we have one and it’s quicker than water bath canning. First of all, can anyone out there tell me why my followers are no longer showing up on the blog page? In case you hadn’t noticed, I’ve posted several breakfast pics. That’s because I really like breakfast food and can eat it for any meal. Today, it was just scrambled eggs and fried cheese grits. I sauted some onion and red sweet pepper in olive oil, beat up two eggs with a little cream (for fluffier eggs), and diced a little Cabot sharp cheddar. When the onions were tender, added the eggs and cheese to the pan and slowly folded the eggs into soft curds (Grandma's trick - slowly scramble eggs over med low heat and gently fold into big soft curds as the bottom cooks and serve moist). Meanwhile, I fried up version 2 of the cheese grits - this time, I dredged in corn meal, which definitely reduced the grease spatter. Meal was very good and I have enough grits for one more time. Forgot the bacon this morning but it’s better for me to do so. I’ve been wanting beef stroganoff for a while, but didn’t want to put a lot of effort into it tonight and remembered a Paula Deen recipe that looked pretty good on her show. I used a choice sirloin for the meat, cremini mushrooms and homemade beef stock – otherwise just followed the recipe. Pretty simple to prepare – which is what I was looking for. I’m a long ways from a stroganoff expert, but thought it turned out good and satisfied the urge. Yes Rhett, it's a meal worth a picture or two. (This was for our son serving in Korea who I think makes fun of my food pics). Sliced the meat and tossed in flour seasoned with Tiger Seasoning and browned. Cooked up the other items per the directions and ended up with a nice sauce. Plated over the egg noodles – that turned out to be a big plate full, but I managed to eat it all. When things are in a knot, I find that they don't seem quite so bad after a good nights sleep. Welcome to fall - my favorite season. 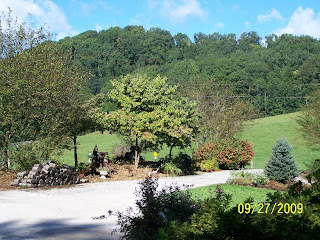 I’m really enjoying other people’s blogs – the scenery, the adventures, and the food. When I was growing up, fried cornmeal mush and our version of scrapple, see below, were occasional menu treats. I can still picture my grandma standing over a big pot of (always yellow corn meal) mush spitting out steam resembling Yellowstone’s mud pots and showing me how to tell when it was cooked just right with the dripping off the spoon test. After reading Chez’s blog yesterday Link, I was inspired to make a small batch of cheese grits for frying up today. Here’s my plate of grits fried naked, ala grandma, some more bacon and a couple of fried eggs. All was delicious, but next time I’ll dredge them in corn meal to reduce the amount of grease spatter from the water in the grits – I trashed the stove. I could have cooked them a little more crispy as well, but the eggs were done and I don’t like hard eggs. Washed it all down with some homemade mater juice. Oh well, life’s a journey and tomorrow is another day to make improvements on what I did today. Plan to make up a batch ala Cowgirl Link which is meat with cornmeal in it, more like traditional scrapple vs. my family recipe. We invited some friends over for dinner and an exciting evening of Canasta (that's a card game for you young folks) and decided to cook from what we had around, ala Chez. So it’s sliced brisket - reheated in it’s juice - and burnt ends from Wednesday’s BBQ cook, fried okra, slaw, green bean casserole from some left over blue ribbon pole beans, and homemade bread. Planned to have boiled silver queen corn from the garden but I would have had to wade in mud to pick it - so we passed. Note a typical BBQ meal combo, but mighty fine eatin. "And just what do you do with all that bacon Larry?" Glad you asked. How about warming it up and putting it between two slices of yesterday-baked homemade bread (Bev has gotten really good as this) along with a fried egg, an out-of-the-garden mater, lettuce, good cheddar cheese, and a little Hellman's Real. 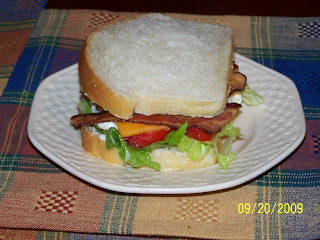 Not sure if it's a BLT with an egg or a bacon and egg with lettuce, tomato, and mayo, but whatever it's called, it went down sooooo easy. I needed comfort food this morning as both my West Virginia alma mater and adopted Tennessee went down in defeat yesterday. Seems as good a reason as any not to eat a bowl of cold cereal. If I could eat only one meat for the rest of my life it would be good, crispy bacon – which helps explain my size and daily dose of Lipitor. As a kid, bacon was always fried in a skillet, which trashed the stove. Later came use of a special platter for cooking in the microwave, which trashes the micro and the difficult-to-clean up platter and takes a long time in small batches. At my daughter’s suggestion, we tried the oven, which cooked it just right, but trashed the oven. So finally the little light bulb went off, and I realized I owned an oven that was already greasy – my gas grill. So I bought three pounds of good country cured bacon from Benton’s - https://bentonshams.com/order/index.php - wrapped a couple of jelly roll pans in foil, added racks, and commenced to cooking. After a couple of try’s, I settled on heating the grill up with all burners on high and adjusted to hold at 350* on the lid thermometer, added the bacon, and closed the lid. Since my grill runs hotter in the back, I turned the pans around after 6 minutes. For pretty thin cut bacon, cook time was about 12 minutes and it turned out just the way I like it. The finished batch, ready for the frig. Then it's just a few seconds in a paper towel in the microwave and serve up with my favorite meal - bacon and almost anything. When finished, I just put the racks in the dish washer, let the grease harden, rolled up the foil and tossed in the trash – and the grill looked just like it did when I started. I used the grill, as this bacon was already smoked, but next time I believe I’ll buy regular bacon, run the temp up in the smoker when I get done queing and try it that way. As an aside, remember when your were young and very flexible. This is the way I found my granddaughter when I got up Thursday morning. It hurts just looking at the picture.